What do you do to take care of your skin? Do you often go out in the sun? Do you know how much damage those rays actually do when it hits your skin? If not listen up, because aside from ageing, it's the one that causes unbelievable dryness, dark spots, even skin cancer because it just wasn't designed to stay in the heat that long. Well for starters, it's why skin experts have come out with sun block lotions, to at least get you the necessary sun protection factor that you need if you need be out there in the sweltering heat of the old star. Good thing it doesn't have to be expensive or imported at all because we have the Kojiesan Sun Patrol to stand guard. Those sun moments should not be a time to just hide, you just need to protect yourself with lines that they have which can protect you from harmful UVA and UVB rays. 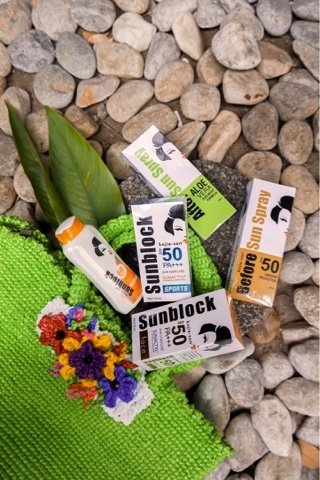 You need to have the care that your skin deserves, so if you're out in the stores, try to look for some Kojie•san Sunblock SPF 69 PA+++, or perhaps Kojie•san Sunblock Face SPF 50 PA+++, Kojie•san Sunscreen SPF 55 PA+++ with Lightening, Kojie•san Sunblock Sport SPF 50 PA+++, Kojie•san Before Sunspray SPF 50, Kojie•san After Sunspray, and the cute Kojie•san Kids SPF 30 and SPF 50 so you can let them play! If you want to know more about these, please like the @kojiesansunblockph Facebook page because there's a lot more things that can help you there. Just go enjoy the vacay, frolic in the sand, enjoy the beaches and just sit back while Kojiesan Sun Patrol and protect you, because you'll surely love it! You really don't have to hide!